Hindustan Unilever’s Lifebuoy has launched an inventive new health centric campaign. The brand which has been known as a proponent of hygiene and handwashing has taken it a step further, into CSR territory. The unique ‘Help a Child Reach 5’ campaign is based on the heart-breaking fact that every year nearly 2 million children die before the age of 5 due to infections, which can be prevented by propagating cleanliness beginning with the simple act of washing hands. Lifebuoy has showcased the strides it has made in making a difference through a fantastic 3minute ad film available on Youtube. A special mention for the concept and soundtrack. We all love a brand that is socially responsible, don’t we? 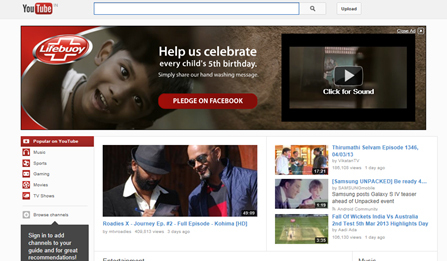 Unilever is promoting the film and its efforts with a well-rounded social media and video campaign on the web. The campaign sits on Youtube, considering the ad film is the hero this seems like a natural fit. They do have an app on Facebook that gets fans to take a pledge to spread the word. They also have a Twitter hashtag #helpachildreach5, though the handle has been dormant for a while. A great idea and a super execution. Do you like it as much as I do?